Life insurance can be a tremendous liquidity tool to pay estate taxes within a short period of time. It can also be an effective tax-efficient and tax-advantaged asset. Most life insurance policies are less expensive than other methods to pay estate taxes and can prevent other valuable assets from having to be liquidated. Graph depicts potential costs per million dollars of estate tax. Life insurance insurance figure based of healthy male, age 54. Create or increase the size of an estate. 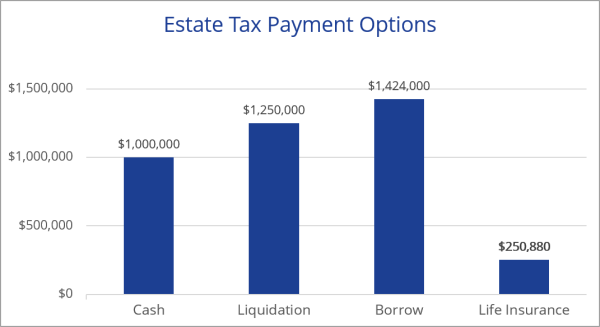 Estate liquidity to pay debts, administration, and taxes. Cover business debts and support business. Replace gifted assets for spouse or children. Provide income to spouse and family.